Houthi media released images of the missile it says was fired towards Saudi Arabia. The mentality of this regime, and its four decades of unjustified rule, has resulted in the status quo of constantly choosing between bad and worse. Following similar ballistic missile launches on Nov. 4th and 30th, the Houthis on Tuesday resorted to yet another such attack resulting in the Saudi air defense downing the projectile northeast of Riyadh, located 850 kilometers from Houthi controlled areas of Yemen. Condemning the attack “enabled by the Iranian Islamic Revolutionary Guard Corps,” President Donald Trump in his Wednesday phone call with Saudi King Salman “discussed the importance of engaging the United Nations to hold Iran accountable for its repeated violations of international law,” according to a White House readout. This measure can be weighed as in response to an unprecedented press conference held by U.S. Ambassador to the U.N. Nikki Haley, displaying remnants of various military equipment, including parts of a ballistic missile, an unmanned aerial vehicle and an anti-tank guided missile, all made in Iran and provided to the Houthis of Yemen. Ambassador Haley also described Tuesday’s missile attack by the Houthis as bearing the hallmarks of a weapon provided by Iran. “One of the missiles bore castings similar to that of an Iranian entity on the list maintained pursuant to resolution 2231, he added. “In terms of restrictions on arms-related transfers, the Secretariat is confident that close to 900 of the assault rifles seized by the United States in March 2016 are identical to those seized by France also in the same month, which the Secretariat had assessed were of Iranian origin and shipped from Iran, Mr. Feltman said. “The Secretariat is also confident that half of the 200 rocket propelled grenade launchers had characteristics similar to Iranian-produced RPG launchers. “Further, the Secretariat had received information on an unmanned surface vessel (USV) laden with explosives allegedly used against the Saudi-led coalition and had the opportunity to examine parts of its guidance and detonation systems, which included a computer terminal with a dual English/Farsi keyboard and characteristics similar to those of Iranian-produced terminals. 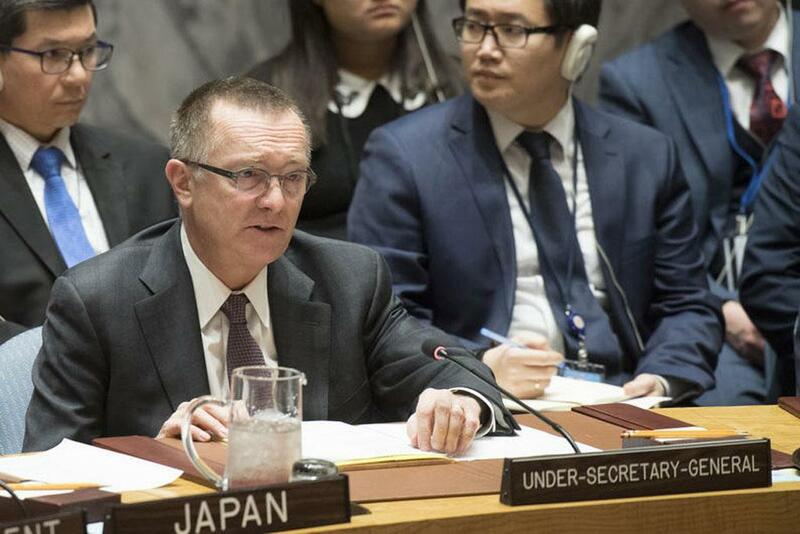 Under-Secretary-General for Political Affairs Jeffrey D. Feltman at the Security Council briefing on Non-proliferation. To add insult to injury for Tehran, Ambassador Haley argued the new U.N. Secretary General report provides basis for new pressure on Tehran’s ongoing behavior, such as a new resolution or strengthening already existing measures. Today, the international community called on #Iran to respect #humanrights, through a Canada-led resolution adopted by the @UN General Assembly. Canada will continue to advocate for respect for human rights in Iran. The onslaught of crises troubling Iran includes a very dangerous row between former president Mahmoud Ahmadinejad – once considered a very close confidant of Supreme Leader Ali Khamenei – and the judiciary, another entity considered tightly under Khamenei’s influence. During May’s presidential elections Ahmadinejad refused to bow to Khamenei’s recommendation to refrain from participating, sparking a significant dispute among the hardliners and rocking the boat in Iran’s highly turmoil seas of domestic politics. The judiciary recently threatened to accuse Ahmadinejad of “sedition” and supporting Babak Zanjani, an oil-tycoon known to have stolen billions of dollars’ worth of revenue and reportedly enjoying extensive ties with senior regime officials. Considering the increasing foreign calamities Khamenei’s apparatus faces on a daily scale, such internal rifts couldn’t have arrived at a worse timing. U.S. President Donald Trump’s inaugural national security strategy describes Iran as a “rogue state” and a principal challenger to U.S. interests in the Middle East. While the text blasts former president Barack Obama for sealing a “disastrous, weak, and incomprehensibly bad deal with Iran,” a recent bombshell published by Politico unveiled how the Obama administration literally protected a $1 billion Hezbollah-led drug trafficking network to maintain Iran in line with an already controversial nuclear pact. Hezbollah is a terrorist designated group launched by Iran in Lebanon in the early 1980s. To confront all these crunches, Iran has no solutions other than resorting to an old tactic of creating new mayhem to robe previous others. This behavior would seem illogical for a stereotype government, but Iran is anything but a normal or stereotype government. For example, in the year 2000, after enduring Mohammad Khatami – now under house arrest – as president of his regime for four years, Khamenei had no choice but to pave the path for his second term. Yet to coat such a setback, Khamenei ordered a major missile attack against the Iranian opposition People’s Mojahedin Organization of Iran (PMOI/MEK), then stationed in a series of bases aligning the Iran-Iraq border. While the PMOI initially reported 77 missiles targeted their bases, years later former IRGC chief Rahim Safavi said the avalanche consisted of 1,000 long and medium-range fired from Iran into Iraqi soil. The bottom line is that Iran is facing major domestic and foreign dilemmas, to say the least, and its tactic is to screen one impasse through creating yet another. This is no regime to arrange deals and agreements with, and this is no time to decrease any pressure on Iran. The international community must adopt a firm policy to force Tehran into relinquishing such a slate of belligerence, including its ballistic missile program, support for terrorism and proxy groups, and human rights violations at home. Otherwise, rest assured this regime will mushroom newer and more serious calamities across the board. This article was written by Heshmat Alavi from Forbes and was legally licensed through the NewsCred publisher network. Please direct all licensing questions to legal@newscred.com. next Don't be fooled. Kim Jong Un is preparing to negotiate.